By the time you’ve got through the first page of A Guide to the Project Management Body of Knowledge (PMBOK® Guide) you’ll have come across the terms Knowledge Areas and Process Groups. (They are always capitalized because they are really important.) Add to that a ‘normal’ process and you’ve got three very different things that form the backbone of the book. But here’s the thing. They overlap, interact and depend on each other. It’s so easy to get confused between a PMBOK® Guide Knowledge Area and a Process Group, and then don’t get me started on all those processes that are supposed to fit in somewhere. It’s essential to get your head around how everything slots together when you are preparing for the Project Management Professional (PMP)® exam. OSP International LLC, the creator of The PM PrepCast, has been reviewed and approved as a provider of project management training by the Project Management Institute (PMI)®. As a PMI® Registered Education Provider (R.E.P. ), we have agreed to abide by PMI established quality assurance criteria. Trust me – it does all slot together. By the time you get to the end of this article you’ll fully understand the difference between a Knowledge Area, a Process Group and a process. You’ll know how they complement each other and most importantly, you’ll know why they matter. Because at the end of the day understanding all this stuff is fundamental to delivering projects successfully, not just passing a test. Chapter 1What are the Project Management Knowledge Areas? Chapter 2Why do we have Knowledge Areas? Chapter 4What are the Process Groups for? Chapter 5So what exactly is the difference between Knowledge Areas and Process Groups? Chapter 8Which processes do I use? Chapter 9Do I really have to learn them all for the PMP Exam? Chapter 12How long should I spend revising the Process Groups and Knowledge Areas? Chapter 13What is Project Integration Management? I signed up for The PM PrepCast, bought a copy of the PMBOK® Guide, and began to study the standards as set forth by PMI. I quickly understood the terminology, and began to understand the knowledge area flow and process groups. Project Management Institute, A Guide to the Project Management Body of Knowledge, (PMBOK® Guide) – Sixth Edition, Project Management Institute Inc., 2017, Page 25. That’s a lot of knowledge! Each Area represents a complete area of specialization including jargon, tools, concepts and tasks. In other words, you need to know about each of them in order to be able to successfully manage a project. Depending on the project you’ll need to know more or less about each one – you might not need to procure anything on a small project, for example, so you can knock off Number 9. However, in order to achieve your PMP® credential you’ll have to answer questions on each of them. Knowledge Areas are made up of processes. More on them later. Why do we have Knowledge Areas? Plan on studying one Knowledge Area per week as you prepare for the exam. Study the same area in all your study materials in parallel. Excellent question! Perhaps because trying to memorize all the processes for the exam is tough and grouping them together helps? That might be a spin-off benefit but it’s not the real reason. The real reason is because most projects use most of these areas most of the time. The general consensus (or we could call it project management best practice) is that you have to be able to work across these areas in order to get your project done. The Knowledge Areas are a handy way to group together theory and practical techniques. They link up the major themes or professional fields that a project manager has to operate in to get a project done. Something to remember is that this list of ten is not exclusive. You may have to draw on any other professional skill in order to complete your project, like leadership or litigation. However, for most people, being proficient in the areas covered in the PMBOK® Guide will be enough. The Knowledge Areas give you a broad base from which to draw. These processes help you define a new piece of work – either a complete new project or the phase you are about to begin. They ensure you have authority to proceed. These processes help you define objectives and scope out the work to be done. They also encompass all the work around planning and scheduling tasks. Again, they can cover a complete project or just the phase you are working on right now. Or you might be closing one phase and planning the next in parallel. You do these processes as you carry out your project tasks. This is the ‘delivery’ part of project management, where the main activity happens and you create the products. These processes let you track the work that is being done, review and report on it. They also cover what happens when you find out the project isn’t following the agreed plan, so change management falls into this Process Group. You’ll run these processes alongside those in the Executing Group (mainly, but alongside the other Groups too) so you monitor as you go. Finally, these processes let you finalize all the tasks in the other Groups when you get to the point to close the project or phase. It would be nice if your project walked through each of these Groups in a neat, linear order. That doesn’t happen in real life. As you can see above, you’ll spend time in each Process Group and then maybe go round again during the next phase. Monitoring and Controlling happens from Day 1 – it ramps while the project is in the delivery phases but it goes on throughout. 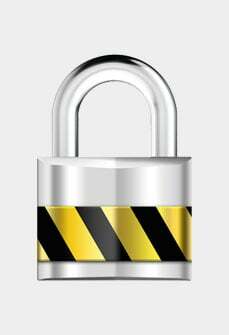 You can close a particular activity at any point, not just at the end of the project. The Process Groups are not the same thing as a project life cycle. A life cycle shows how the project moves from start to finish in different phases. Within one phase you might go through all the Process Groups, or just some of them, so don’t confuse the two. You can remember this for the exam by noting that all the Process Group names finish with ‘–ing’. They are verbs (doing words). Life cycles are described with nouns: Initiation, Execution, Closure. Watch out for questions in the PMP exam that ask you to pick terminology because choosing Initiation, Execution or Closure would be wrong! What are the Process Groups for? Process Groups bundle together processes (they’re coming up…promise) that often operate around the same time on a project or with similar input and outputs. Once you’ve got comfortable with them they are actually a very logical way of grouping together the things you have to do. So what exactly is the difference between Knowledge Areas and Process Groups? They cover what you need to KNOW. They cover what you need to DO. Process Groups help you apply what knowledge you have about the different professional areas of project management. They let you take your knowledge and step you and your team through exactly what you have to do at each point. Clear now? 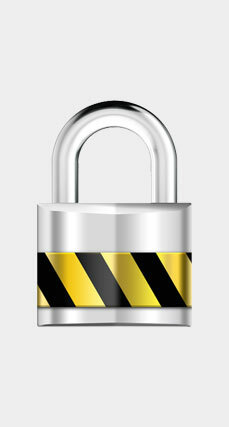 There’s only one more piece of the PMBOK® Guide backbone to look at. Finally we’re going to talk processes! Know all the processes, what sequence they are executed in and which process group they fall into. The PMBOK® Guide defines a process as “a set of interrelated actions and activities performed to create a pre-specified product, service or result.” It goes on to say that “project management processes ensure the effective flow of the project throughout its life cycle.” Processes get things done. Each process has pre-requisites (known as inputs), tools and techniques you can use to actually do the process, and then outputs: one of more things that you get as a result of having done the process. The achievement of those things lets you know the process is over (at least until the next time you need to use it). There are around 50 processes in the Guide. The main part of the book is split into ten chapters, each of which deals with a PMI Knowledge Area. Each chapter details which processes apply to that Knowledge Area, and each process falls into a Process Group. In his book, Mastering Project, Program, and Portfolio Management: Models for Structuring and Executing the Project Hierarchy, Gary Lister explains how the processes are split between the five process groups. It’s not an even split. He explains that over 50% of the processes fall into the Planning Process Group. Read the relevant chapter from his book and take a look at the bar chart yourself: it makes it really clear that planning is essential if you want your project to be a success, and that you’ve got the most work to do in that area. I’m not going to list them all here because there’s a chart in the PMBOK® Guide which does it perfectly. It’s the one I recommend to students all the time. I used the PMBOK® Guide Appendix to enforce and visualize the flow and integration of each process area. Doing so showed me trends in inputs and outputs and showed me how processes flowed within a process group vs a knowledge area. I also memorized PMBOK® Guide table 1-4. Table 1-4 in the PMBOK® Guide shows you the Knowledge Areas down the side, the Process Groups along the top and then maps the difference processes in the relevant boxes where those two axes cross. For example, at the junction of Project Integration Management and the Initiating Process Group you have the process to ‘Develop Project Charter’. 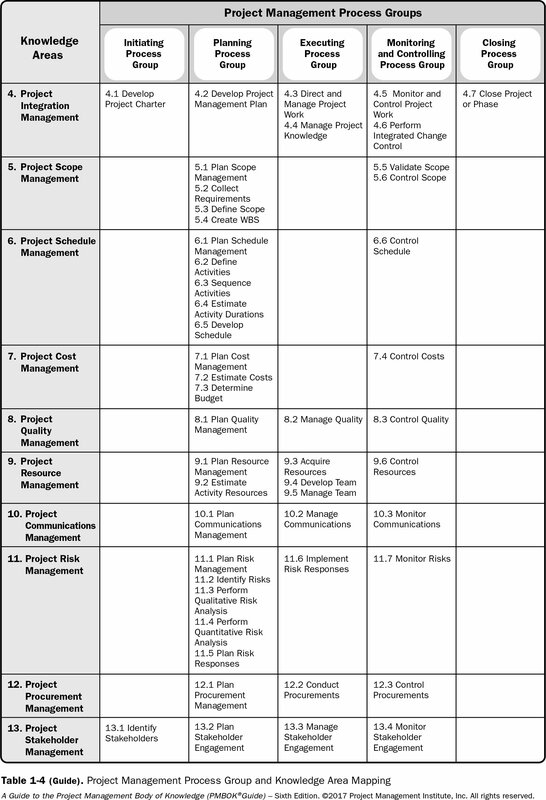 This table explains the project management process groups and knowledge areas mapping. You’ll see that some cells in the table are blank. That means that there are no processes associated with that particular stop along the project journey. There’s very little in the Initiating Process Group actually, but you’ll see that each Process Group has at least two processes (otherwise it wouldn’t be a group, would it? It would just be a single process). It’s a lot easier to look at the table than for me to describe it. Take a look at it below or turn to the relevant page in your copy of the Guide. Many students flick to this page in their Guide and suddenly the interplay between Knowledge Areas, Process Groups and processes becomes clear. I recommend using a sticky tab to mark the page in your copy as you’ll be referring to this table a lot during both your PMP studies and your day-to-day work as a project manager. Which processes do I use? The short answer to this question is that you use the processes that help you get the job done. Ideally, everyone in your business should use the same processes for the same activities. There is huge benefit in everyone using the same processes for the same activities. PMI’s Pulse of the Profession® study reported that high-performing organizations are three times more likely to use standard processes across the organization than low performers. Using project management processes really does improve project success. This article from PMI gives you some examples from organizations which have seen the benefits of using standard processes. It’s your responsibility to choose the right processes to give you the desired outcome. There’s no point choosing to carry out all the processes around procurement if you aren’t buying anything. Pick and choose the processes that will work for you and your project. You’ll need a degree of professional judgment to do this so if you are just starting out you might be nervous about selecting the right processes. Don’t be. It’s largely common sense. And if you still aren’t confident about making the right decisions then talk to your manager or mentor. A good rule of thumb (until you have built your own bank of experience) is that it’s better to apply the processes and then realize you didn’t need to than leave them out and regret it later. However, you’ll need to know about all of them to get through the PMP exam successfully. Do I really have to learn them all for the PMP Exam? Yes. Let’s look next at how you can prepare, because you do need to know them all. Almost there! complete the form below to access the free PMP® Training. Jot down the Knowledge Area/Domain Matrix and the key formulas once you get started. They will help you at the height of your exam. If you’ve got this far, you’re probably thinking about taking the PMP exam. Maybe you’ve already submitted your application (in which case – congratulations! You’re one step closer to becoming a PMP). The Knowledge Areas form a significant part of the exam. You’ll also get questions on individual processes, for example questions covering the inputs, tools and techniques and the outputs for a process. A good starting point for preparing for the exam is to memorize the table. Then take some time after you started your exam session to write down your own notes – a crib sheet – before answering the first question. Investing a few minutes of your actual exam time is an excellent way to get this written down, as it allows you to dump all your revision from your brain onto paper so it’s there for you to refer to during the exam. It’s also a good way to relieve stress as you know you’ve got your notes to hand. I call it a brain dump and it should definitely include this table. Use your favorite techniques for memorizing it, whichever revision technique you think will give you the best result based on your learning preferences. There are some good tips for memorizing the table in Bruce Garrod’s article on the PMI Community website. However you choose to remember it, think about the logic behind it. Every process maps to a Knowledge Area and a Process Group, and there is a strong rationale for why they fit together in that way. Understanding how you would use the process on a real project will help you see where it fits on the table and also in the context of your day job. The more you focus on why the process features on the table at all, the easier it will be to place it. The added benefit of this approach is that if you forget where something goes on the table you’ll still be able to answer the exam questions because you can see the bigger picture of how the process is used. The brain dump of Table 1-4 is just one way to get organized for the Knowledge Area questions in the PMP exam. Arm yourself with other revision guides and exam prep tools so that you are fully prepared for anything that might come up relating to processes. 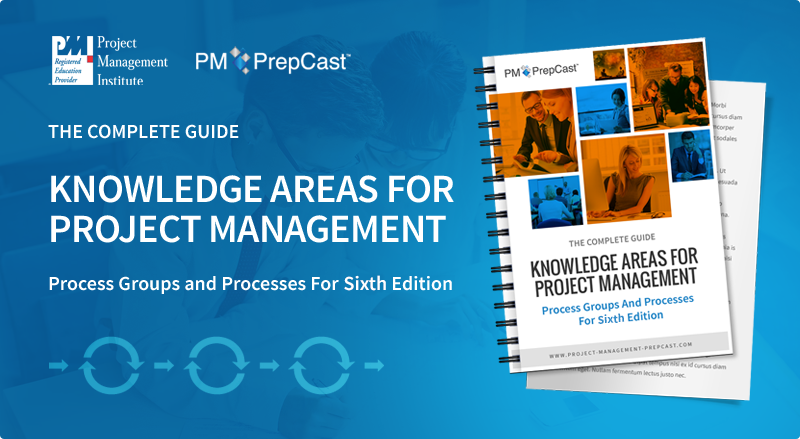 As the Knowledge Areas and Process Groups are such an integral part of the PMBOK® Guide, you’ll want to make sure you are using a comprehensive exam prep guide such as the PM PrepCast. With explanations in everyday English and a complete set of videos covering the entire PMBOK® Guide (and more – if you didn’t know already, you’ll also face questions about topics that aren’t covered in the PMBOK® Guide) it’s everything you need to prepare for success. How long should I spend revising the Process Groups and Knowledge Areas? The amount of time you spend studying the PMI Process Groups and the Knowledge Areas that correspond to them will depend on how quickly you pick up the core concepts. Some students get the mapping and the logic behind it very quickly. Others take longer to feel confident with the ideas and being able to recall them under exam conditions. The best thing to do is to not compare yourself to other PMP aspirants and to work at your own pace. By all means, set yourself a target for when you want to be taking the exam but create a study schedule that works for you and that is achievable. Get the best quality PMP prep tools you can (and they aren’t necessarily the most expensive the PM PrepCast is very affordable) and use them to plan your studies. So far we have done an 'executive overview' of the Knowledge Areas and stayed high-level. But what are some of the details that can be found inside the Knowledge Areas? This video is a lesson taken from The PM PrepCast. It's a good representation of the type of training it offers. Now you have read this complete guide to the PMBOK® Guide Knowledge Areas for project management covering the Process Groups and processes, you should already feel more equipped to plan for and prepare for the exam. Plus you’ll have a much better idea of how to make them work for you on a project. Project Management Knowledge Areas cover what a project manager needs to know in order to successfully manage a project. Processes cover what a project manager and team have to do to deliver a project successfully. Process Groups are logical groupings of processes. It might seem daunting, but with good exam prep guides, a thorough approach to your revision and a brain dump sheet you can rely on, you’ll soon find that working with Knowledge Areas, Process Groups and processes becomes second nature. © 2015-2019 OSP International LLC. All rights reserved. This copyrighted article may not be reproduced without express written consent of OSP International LLC. Need To Ace The PMP® Exam? Need To Ace The PMP Exam? Almost There! Complete The Form Below To Access The Free PMP Training. Want To Master The Skills You Need To Ace The PMP Exam?